©Tony Mould; click to open large version in a new window. Mayor of Brighton & Hove, Councillor Mo Marsh, Councillors Carol Theobald, Ann and Ken Norman and staff from Democratic Services at Brighton & Hove City Council, attended a presentation at Hove Town Hall this morning, of donated boxes of Christmas gifts to local charity Link to Hope. I help collect up these Christmas boxes which are delivered to the charity’s warehouse in Worthing. Link to Hope distribute ‘shoeboxes’ filled with simple gifts like soap, flannels, toothbrushes and socks to needy families and isolated elderly people in poor communities in Romania, Bulgaria, Moldova and Ukraine. Last year, they delivered over 43,000 boxes from kind donors in the UK which all arrived in time for Christmas. 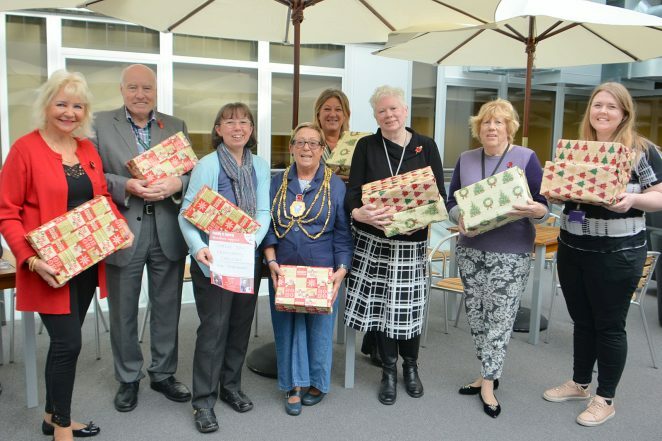 The Shoebox Appeal has been running for 25 years and is always well supported by councillors and staff at the council, who have donated hundreds of boxes over the years. There is more information on the appeal at their website.